Legit question: do any of you care about the Nick storyline, like, at all? Because I could give two hoots. But fine, I'll talk about it really quick since this episode went into it. Nick escapes from police custody at the hospital where he's being kept and goes back to his house, where he talks to the ghost of his wife. She asks him to come back or whatever, and he's like no I choose Lucifer, wherever he may be. Bleep bloop. Okay on to the main story at hand - Sam and Dean are heading toward the ocean, I guess, with the coffin capsule thingy that has a name, I'm sure, but it's not really important. Sam is not stoked about this trip, and even less so when Dean starts apologizing for not always being there for him when they were kids, like some kind of close to death confession tour. So he drums them up a case to take on while on their way. The case involves a kid who has taken to killing people in very biblical ways, and carving enochian script into them after their deaths. They run his name by Castiel and figure out that he was to be the next prophet after Donatello, but he shouldn't have been called yet because Donatello is technically still alive, though in a coma. They find the evil prophet dude just in time before he kills his next victim, and are like dude, you are not hearing GAHHG tell you what to do. He gets so distraught that when he manages to get Dean's gun off of him, he shoots himself in the noggin. Well, so much for that guy. But the bigger question is, why was he called up in the first place? They figure it must be because Donatello is in some in between place, not really alive, but not really dead, and so another prophet was called up, but not called up properly. But that just means it will happen again, unless they do something about ole Donny. They meet Castiel at the care center where Donatello is in his coma, and they're all ready to pull the plug on the guy when the doctor mentions offhand that he's been saying some odd phrases. Luckily they have video of it, how nice, and they realize that he's been speaking enochian. 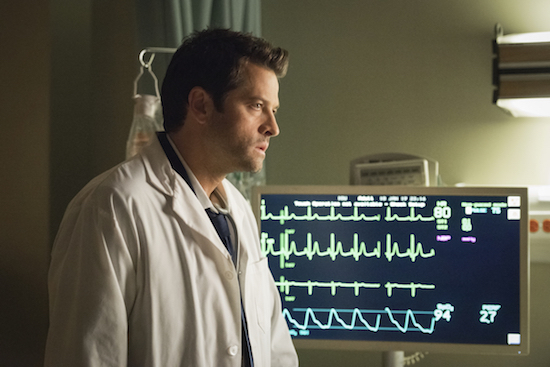 Which I guess means he can be healed, because Castiel does just that, bringing him back from the brink of death. But, lest we forget, Donatello still doesn't have a soul, so all is not completely right with the world. 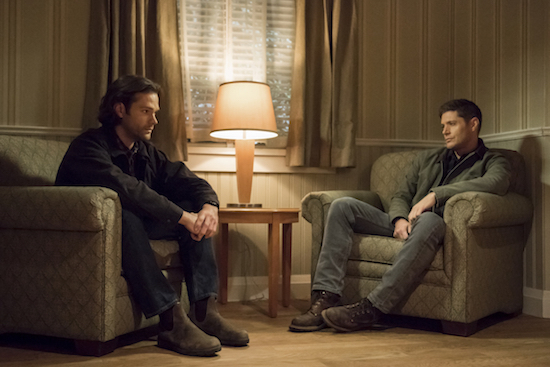 After all of that is over, or as over as it can be, I guess, Sam drunkenly gives Dean a piece of his mind, basically telling him that they don't give up, and he can't understand why Dean would give up so easily. He even goes so far as to punch Dean in the face! My goodness, Sam! Dean eventually agrees to let everyone try as long as possible to find another way to fix things, but also tells Sam that if worse comes to worse, he will need to go in the box. - Am I the only one who didn't remember that Donatello was still alive? - Next week's 300th episode, from what little I saw of the preview that always gets cut off by my DVR, looks like a lot of fun. It's the first episode in a while that I'm looking forward to, to be honest. 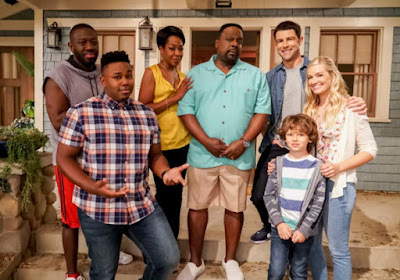 - The show was just renewed for a 15th season. Holy moly. I suppose I will face the dilemma once again whether to continue on with the recaps here or not. - Can we be done with the Nick/Lucifer storyline once and for all? Dean: I never said I wasn't scared. Dean: I don't need to get shaky on this thing. Sam: So if we could not have conversations that sound like deathbed apologies, I would really appreciate it. Dean: Does the name Tony Alvarez mean anything to you? Castiel: This is the regular him but, he doesn't have a soul.